The current government in Ethiopia, the Ethiopian Peoples’ Revolutionary Democratic Front (EPRDF), often claims the multi-national constitutional federalism that it introduced a quarter century ago answered the country’s age-old question – famously known as the ‘national question’ – once and for all. Ethiopia’s constitution, the government further claims, is multi-foundational by its nature and adequately addresses the politics of recognition and inclusion for Ethiopia’s long marginalized nations; better yet it guarantees the right to self-determination up to secession. States are now autonomous and free from the yolk of a centralized state and the notion of “one country, one people, and one language”, a notion that had violently governed Ethiopia’s oppressed mass for at least a century. Today’s Ethiopia is a ‘federal democratic republic’ of nine autonomous national regional states: Afar, Amhara, Benishangul-Gumuz, Gambella, Harari, Oromiya, Somali, Southern Nations Nationalities and Peoples Region (SNNPR) and Tigray. All of them home to an incredibly diverse and free people, so the story goes. For the last two decades, therefore, anyone who questions the accuracy of these narratives is labeled as an outright enemy of this unique polity, a polity born out of its people’s age-old grievances where “unity in diversity” is the order of the day. But a five month persistent protest by the Oromo, Ethiopia’s largest ethnic group, for whom the inaugural of a multi-national constitutional federalism was a long awaited victory, which started in Nov. 2015 has laid bare the otherwise flawless narrative Ethiopians have believed in for more than two decades. What began as an opposition against a The Addis Abeba Master Plan, which was, by any legal standard, prepared in a clear violation of the fundamental principles of federalism, led to historical questions that the Oromo of a federated Ethiopia continued demanding an answer for, including the questions of national identity, of economic injustice and land ownership as well as a genuine political representation. However, a look back at just the last eighteen months alone reveals that the Oromo are not the only ones that seem to be haunted by the re-opening of the old wounds that Ethiopians thought were treated two decades ago. 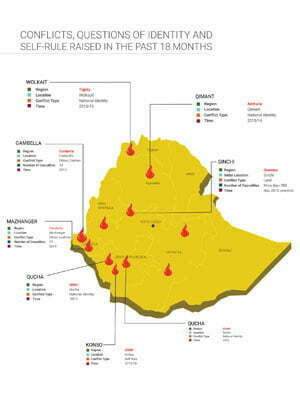 Incidents that resulted in the killings of hundreds, mass arrests and disappearances as well as displacements of thousands of Ethiopians in the hands of the state security apparatus show that the questions of national identity, the urge for self-administration and equitable use of resources (mainly land) and lack of adequate political representation have re-emerged afresh in five out of the nine independent regional states in the federated Ethiopia. Home to around 200, 000 people, the Nuer, Agnuak, Apana, Mezhenger, and Komo are the main indigenous peoples of Gambella. But it is also home to other ethnic groups from the country such as the Amhara, Oromo and Tigray. According to a 2007 census, of the total ethnic composition in Gambella the Nuer consists 40%, followed by the Agnuak who make up 27%, Amhara 8%, Oromo 6%, Mezhenger 5.8%, Keffa 4.1%, Mocha 2%, and Tigray 1.6%, as well as other ethnic groups mainly from various regions in Southern Ethiopia who constitute 5.5%. Unlike the triumphant declaration of a constitutional federalism however, Amharic, which is the mother tongue of neither the Nuers, nor the Agnuaks, is the working language of the State. Historically, Gambella is a region prone to ethnic conflicts. The 2003 unprecedented massacre of more than 400 Agnuaks in the hands of government security forces and ‘highlanders’, according to the HRW, left Gambella stuck in crisis watch list of several international organizations including the United Nations. What happened at the end of January 2016 can therefore be easily taken for the usual sporadic skirmishes between the two dominant ethnic groups; it involved both and covered vast areas in the region, touching villages from Abobo to Itang, Gog to Jor, and a refugee camp in Pugindo, as well as a prison cell in the capital, Gamebella town. By the government’s account 14 people, including Gatdet Gony, Deputy Head of the Transport and Road Development Office, were killed in the clash. Several other accounts put the number as high as 50. The federal government quickly dismissed the cause as a simple confrontation between two men from both tribes, but the cumulative fear by the Agnuaks about the Nuer’s political dominance (which is often alleged to be supported by the federal government) and near absolute control over resources by the Nuer plays a significant role in instigating these conflicts. While the rest of Ethiopia was welcoming the Ethiopian New Year of 2007 on Sept 11, 2014 with jubilant festivities, Meti, a small town in Godere District in Mezhenger Zone of Gambella was struggling to contain a chaos that besieged the villagers. Around 8 AM that morning a group of men broke into a prison located in Kebele 01 and released several inmates who then went door to door to residences of the ethnic Mezhengers, killing many including women and children, according to charges brought against the perpetrators. The Mezhenger consider people who came from various parts of the country, mostly from the highland areas of the North and Central Ethiopia and had settled there as ‘highlanders.’ Some of these ‘highlanders’ had lived in the district for decades. Although the flare ups of many of these conflicts always come in the form of petty individual confrontations between the ethnic Mezhengers and these ‘highlanders’, the fundamental problem is one that Ethiopia’s two decades old constitutional federal dispensation failed to address effectively. The Mezhenger zone is one of the three zones in Gambella bordering in its southeastern part the Sheka and Bench Maji zones of SNNPR, as well as the Agnuak of Gambella and Illubabor of Oromiya to the north. Endowed with abundant natural resources it is a region where the long arms of the federal government easily tampers with. The area is home to large scale tea plantations owned by foreign companies and fertile lands contracted to both local and foreign companies without much say from the Gambella regional state. A recent report by Fortune newspaper, a private weekly, revealed that “Nearly 100 commercial farming investors in Gambella are losing thousands of hectares of land because the region leased by mistake lands under federal jurisdiction.” When asked to comment on the issue, Gatluak Tut Kon, president of the Gambella regional state, told the newspaper, “You should talk to the federal government. I wish to give no comment on the case.” For many who believed in the principles of constitutional federalism that Ethiopian officials claim to have instilled, this was no ordinary news headline. Critics also lament that the demands of the Mezhenger people to want to forcefully evict “highlanders” from their native land comes from the insecurity of resource distribution and a sense of political exclusion. They were always Ethiopia’s marginalized periphery. The response from the regional government was similar to the response the federal government often avails to contain similar demands elsewhere: deploying the region’s Special Forces who asnwered the community’s constitutionally legitimate demands with violence. Although to a lesser extent, the Qucha people, who also reside in the SNNPR regional state, are demanding a similar question: the right to self-administration. Forty elected representatives of the community have come to Addis Abeba at the end of 2014 and have raised the question of national identity and self-rule with the House of Federation. In the north of Ethiopia the Qimant people in the Amhara regional state, north of Gondar, also demand what the Konsos and Quchas were demanding for years. A recent conflict that flared up in Nov. 2015 between the Qimant people and the regional administration is believed to have resulted in the death of several community members of the Qimant people. However, contrary to the people of Konso and Qucha, (and rather uncharacteristic of the regime), the Qimant peoples’ demand for self-administration was addressed in March 2015 when the Amhara Regional state granted them a status of nationality and ruled that they can exercise self-administration. According to the ruling, the Qimant have a right for self-administration in 42 Kebeles in the adjacent Armachiho and Chilga Districts. They can also enjoy the full rights of developing their language as well as their culture. In north western Ethiopia, the simmering question of national identity by the Wolkayit community has recently reached a new peak. In what’s largely believed to be a forceful decision by the federal government, the Wolkayit people are to stay under the Humera Zone of the Tigray regional state. It is a decision that quashed the community’s two decades old demand to join the Amhara regional state, as they identify themselves as Amharas. A few weeks into the protest the people of Wolkayit were paraded in front of the national TV carrying placards that declared all their questions, including their questions of identity, as have been answered once and for all. But as the bumpy road continues to stretch from the North to the South to the West (and seem to grow by frequency as well as magnitude) the first – and perhaps most uncomfortable – step would be to probe if Ethiopia, where the concept of “unity in diversity” avails itself for all to indulge on an equal footing, was ever born in the first place. 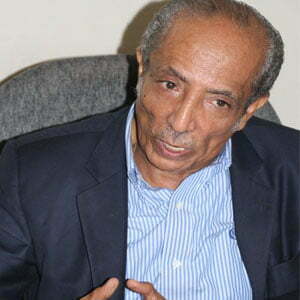 Ezekiel Gebissa, a Professor of History and African Studies at Kettering University, argues that the constitutional federalism the incumbent introduced doesn’t originally belong to it; it dates back to “the Ethiopian student movement” of the early seventies. At the pinnacle of the student movement the question of national identity took center stage, especially among the movement’s leaders such as Walelign Mekonnen. Walelign’s prescription of self-administration up to secession for the politically marginalized became the rallying factor for the would-be guerrilla fighters, who later defeated the Marxist Derg regime, Prof. Ezekiel explains. Although the Derge tried self-administration based on different regions called ‘autonomous provinces’, it was a system that didn’t save the center from an eventual collapse. With the coming to power in 1991 of the ruling EPRDF, therefore, having constitutional federalism was not an option but a necessity, according to Ezekiel. Tamrat Kebede, Executive Director of InterAfrica Group, a think tank, agrees. In addition, he sees the country’s journey from an absolute monarchy through military dictatorship to a constitutional federalism as “a quantum jump”. He believes that with the coming into power of the EPRDF questions of national identity and self-determination were put to the test for the first time. Himself a former member of the seventies’ student movement, Tamrat argues that as much as the questions were debated and discussed, the approach was purely theoretical. Both Tamrat and Ezekiel find the government’s claims that the current constitutional federalism has answered Ethiopia’s age-old questions as exaggerated. A careful look at the lingering cases of the Konso, Qucha, Wolkait and Qimant reveal the uncanny similarity each community’s approaches share to put their constitutionally guaranteed demands to the attention of the federal government; they all invoked legal mechanisms enshrined in the structures of the constitutional federalism. “The skeleton of the structure is in place. But putting it into policy is one thing, implementing it is another,” Ezekiel says. When the Konso people began to protest the demotion of their administrative area from the status of Special District to a mere District, they formed a representative committee to advance their demand for self-administration and managed to collect signatures from more than 5% of the community, well above the constitution’s requirement. The committee then appealed to the Federal House of Federation here in Addis Abeba but the House sent the people (and their questions) back to the regional government. Similarly the Qucha people, who are currently administered under the Gamo Gofa zone of the SNNPR, say that they are not ethnic Gamos, as the current arrangement dictates; they are their own nationality – Qucha. Qucha District, which is home to the Qucha people, has close to 150, 000 people, according to the 2007 national census. And a committee gathered to address the question by the Wolkait people has written a letter on December 2015 to the House of Federation demanding proper response to their question of identity. The committee says that the Wolkait’s right to work and learn in their own language as well as their right to promote and advance their culture have been suppressed in the past, including the 20 plus years of the rule by the EPRDF. But these glitches do not make Tamrat of InterAfrica Group lose faith in the constitutional federalism Ethiopia is following. In his interview with this magazine Tamrat says practicing a complex federal system such as that of Ethiopia’s will “inevitably run into enormous constraints and challenges.” “[such a system] entails decentralization; it is sensitive; it requires capacity, both in human terms and resource terms, which are not all readily available when you launch into such a complex arrangement,” Tamrat said. Prof Ezekiel shares Tamrat’s view: adjusting the system itself as needed, “requires a careful, thoughtful, deeply concerned implementation” he says. But Ezekiel is critical because that never happened in the last two decades. “The question that brought the very existence of Ethiopia into a country was never fully answered”. The reason for this, according to Ezekiel, lies in the undemocratic nature of the incumbent. Once in power the EPRDF “thought that they could do whatever they want; they could engineer any outcome; they could muzzle dissent; they could decimate opposition and tell the politically marginalized nationalities on the highland and on the lowland that ‘you have a constitution, your questions have been answered and you have no other question’”. Analysts who follow Ethiopia closely argue that recent incidents happening in all corners of the country: the demands for economic justice, self-administration and national identity are symptoms of a disease far deeper than the current government dares to admit. Tamrat is one of them. “These signs should force us to question what it is that we are not doing right,” he says, “or why is this structure we have created to precisely avoid these kinds of problems creating these problems? Could it be that we issued rights that are not being exercised? Have we not prepared ourselves for the manner in which they are to be exercised? That could very well be,” he says. Ezekiel believes that the disastrous handling by the federal government of almost all of these incidents (such as disarming regional police, intervention without due parliamentary process, committing crimes with an absolute sense of impunity and several other signs showing excessive control of the federal government against these national regional states) show that the party that likes to take total credit for creating Ethiopia’s constitutional federalism is becoming the system’s enemy number one. Tamrat too shares Ezekiel’s concerns. The government’s ways of handling public resentments, which include the application of excessive force, does not manifest proper and competent handlings. Campaigners and activists say the recent widespread public protest in Oromiya, which saw the federal army being quickly deployed, left more than 400 killed, twice that number injured, and thousands incarcerated. The federal army roamed many of the streets where protests broke out; and the whereabouts of hundreds of people remains unknown. Members of the Konso community said that several of their people, including their leader, are incarcerated or have unjustly lost their jobs following their demand for self-rule, although many of them were released since the writing of this story. Going to the Qucha community in the South, in January 2015 the Gamo Area High Court has sentenced 27 members of the community to up to 16 years imprisonment for allegedly instigating violence and causing damage on people and properties fourteen months earlier. According to the charges presented against them, they were trying to operate illegally to forcefully obtain a status of nationality for the Qucha community. And to advance their cause, the charges add, they attacked residences of Kebele officials. For Tamrat, some of the challenges the country is struggling with currently require an expanded political space, “to be debated, to be discussed, to [bring forth] appropriate responses. I see a deficit in that regard,” he says. “Any proposal for constitutional amendment, if supported by two-thirds majority vote in the House of Peoples’ Representatives, or by a two-thirds majority vote in the House of the Federation or when one-third of the State Councils of the member States of the Federation (by a majority vote in each Council) have supported it, shall be submitted for discussion and decision to the general public and to those whom the amendment of the Constitution concerns,” the Article reads. A change towards democracy is a must if the country is to avoid regrettable tragedy, Ezekiel says. “People at the top of the government must know that the status quo is not sustainable”, he argues, “because there is too much discontent, too much dissatisfaction, a lot of desperation, a lot of deprivation,” Ezekiel said, adding that the government must stop listening to the reverberation of its own voices and understand that this is not a sustainable path. Several Ethiopian critics of the government assert that the fundamental problem of the recent conflicts that besieged several areas is the constitutional federalism itself. According to these critics, it focuses more on differences than unity. Some fear it may even lead to an eventual disintegration of the country. A return to the old unitary system of administration is an idea whose appeal seems to gain increasing popularity among many Ethiopians. But it is an idea both Tamrat and Ezekiel strongly disagree with. But back in the power corridors of the government in Ethiopia exhausting propaganda is being relentlessly produced and aired through state affiliated media claiming that the federal arrangement not only answered the ‘national question’ but also put the burning question of land ownership, and the nation’s quest for self-rule, which saw the previous two regimes toppled by the will of the people, to their final resting place.